Lluís Coll, researcher at Forest Sciences Centre of Catalonia CTFC. "Forest management for adaptation: from processes to actions"
The different components of global change threaten the difficult equilibrium between the acquired anthropogenic structure and functioning of many Mediterranean forests and the future provision of ecosystem services required by human societies. Anticipating these impacts requires (i) an adequate ecological knowledge on how forest systems are going to respond to global changes and (ii) that the information provided by ecosystem assessments is integrated into appropriate strategies and tools to adapt to future changes. In this talk I will present the series of studies conducted in Mediterranean mountains aimed at understanding the main drivers of forest dynamics. I will then discuss how the knowledge generated can be incorporated into current or future management strategies. 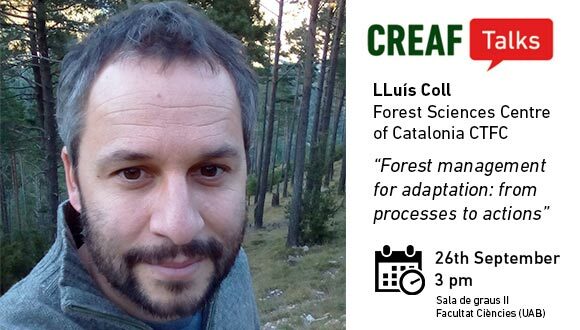 Lluís Coll has bachelor degree in Forestry (University of Lleida, 1999) and holds a PhD in Forest Ecology (University of Clermond Ferrand, 2003). He is currently lecturer at the at the Department of Agriculture and Forest Engineering of the University of Lleida and researcher at Forest Sciences Centre of Catalonia (CTFC). He is also associate researcher at CREAF (since 2011) and at the Centre for Forest Research in Québec (since 2015). His research interests focus on the analysis of the main factors driving Mediterranean forest dynamics particularly after natural and anthropogenic disturbances. During the last 10 years he has participated in different research projects funded by some of the main national and international research programs and he has coordinated different contracts with the Catalan forest administration. He has also published in leading scientific journals in the field of Ecology and Forestry and is Associate Editor for the European Journal of Forest Research.